Added on 03 December 2018 . By Olivia Cheves. 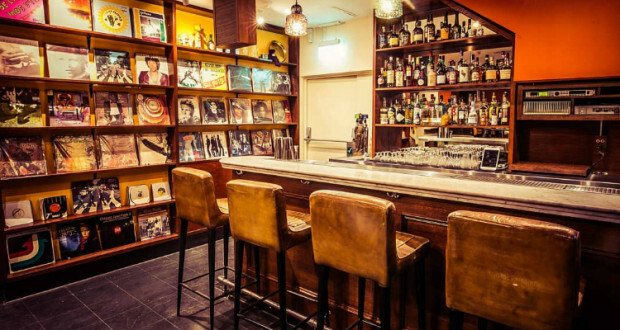 With inviting leather seating and record-covered walls, cocktail spot FAM is the Bond Street equivalent of your best mate's living room, but we can promise the drinks list stretches to more than a bag of cans and some corner shop red. The latest venture from Comunidad's Megs Miller and Dré Masso, the Duke Street watering hole boasts one of the friendliest atmosphere this side of town. The food and drinks menus have been designed to bring you a taste of home comforts done excellently. With that in mind, you'll find signature margaritas and elegant cocktails crafted from locally sourced spirits and ingredients at the bar, including the Stevie Wonder-inspired Sir Duke made with London vodka and nettle cordial. The Goring-alumni Tim Ross-Watson has control of the bar snacks so get ready to chow down on cheese and ham toasties and mini cups of butternut squash soup with milk bread soldiers.